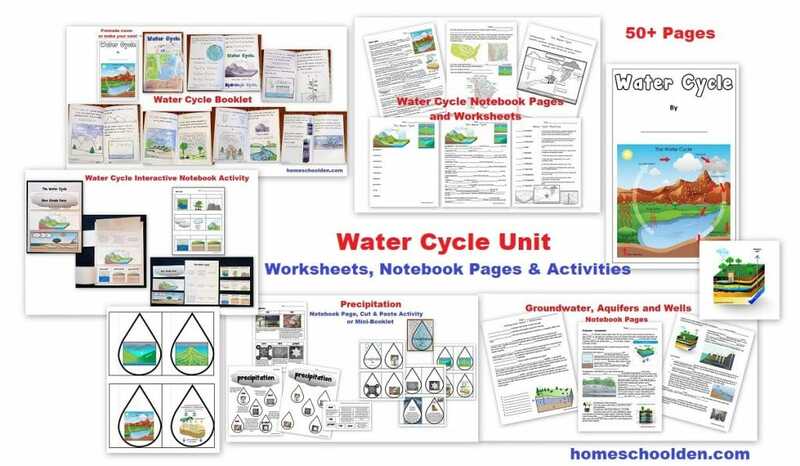 This new 50+ page Water Cycle Unit has a number of activities for learning all about the water cycle. This is the first of three Environmental Units I’m doing with the kids. When I first release a new packet, I like to offer them at a discount. 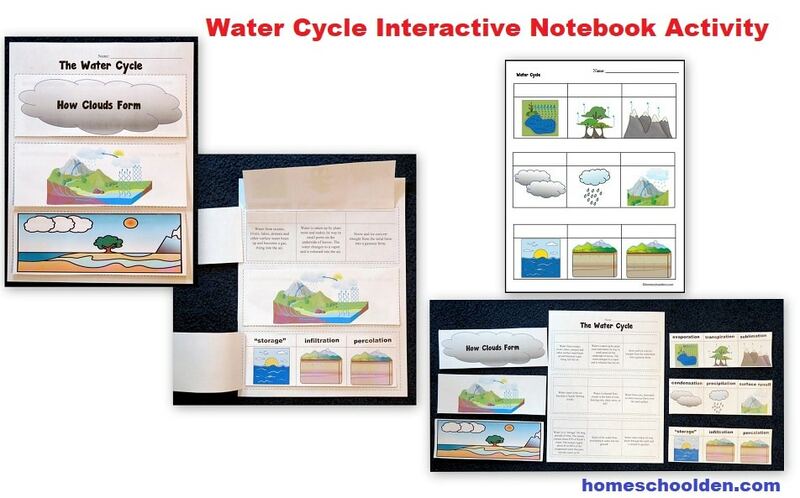 The Water Cycle unit is currently 50% off through April 30, 2019 – 10pm EST. 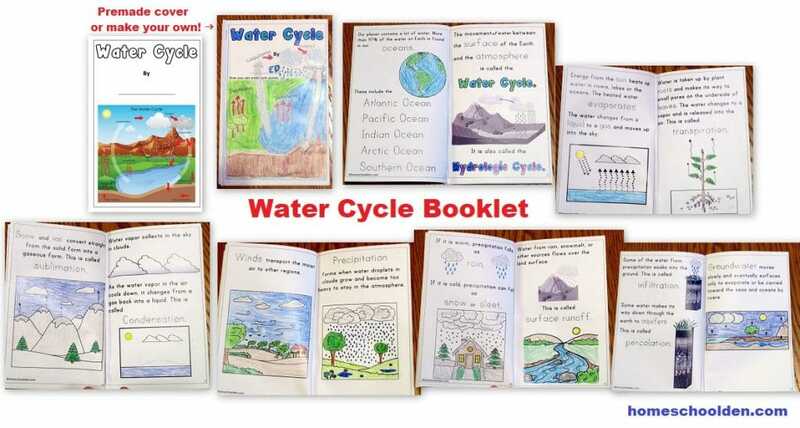 Water Cycle Booklet: My daughter started this unit coloring and working on this Water Cycle booklet. 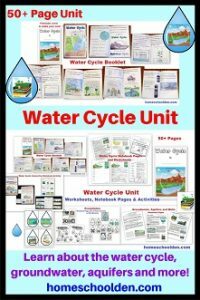 It covers basic information about the water cycle and covers the major terms such as evaporation, transpiration, sublimation, condensation and so forth. Water Cycle Notebook Pages:We then went over a water cycle notebook page. We read that together and the kids filled in the missing words. Another day we went over the vocabulary worksheets to make sure the kids knew not only the common words like evaporation, condensation and precipitation, but also the trickier words like sublimation, transpiration and knew the difference between infiltration and percolation. We also went over watersheds and divides. 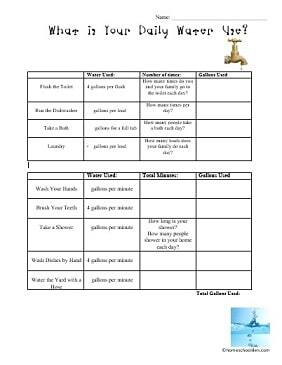 Water Cycle Interactive Notebook Activity:ED did an interactive notebook activity. If your kids don’t want to do the activity, you can print out the notebook page and write in the missing terms (evaporation, transpiration, sublimation, condensation, precipitation and so forth). 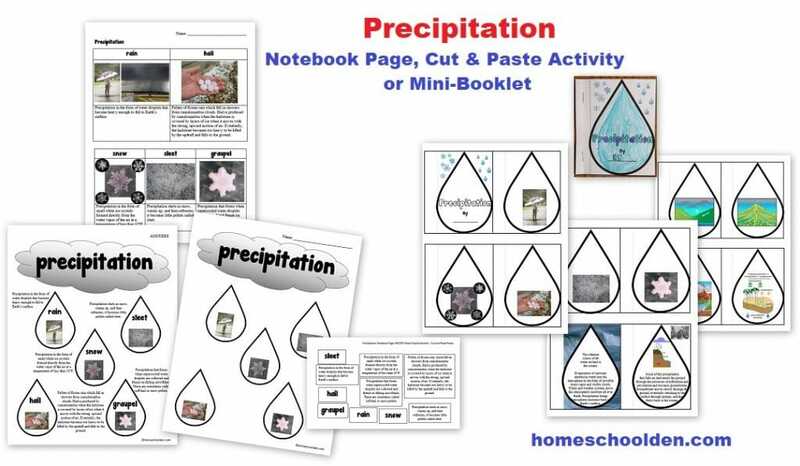 Precipitation: We spent some time talking about the major forms or precipitation – rain, hail, snow, sleet and graupel. Yes, that’s a strange word, but we learned that graupel forms when supercooled water droplets are collected and freeze on falling snowflakes. 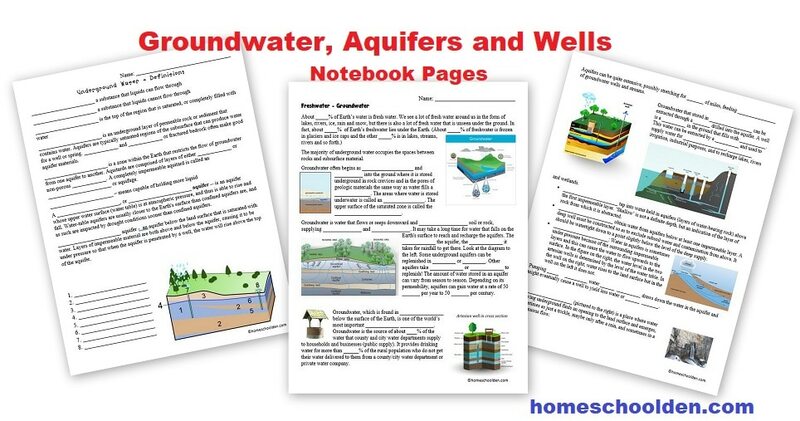 Groundwater, Aquifers: Finally, we spent some time talking about groundwater, aquifers and wells. There is a definition page and also a couple of notebook pages (or your kids can read the reference pages provided). After payment, you should receive an email from SendOwl (the delivery service I use) almost immediately with the download link. Be sure to check your PayPal email address for the download link! 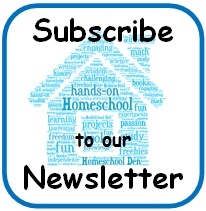 If you have any problems or questions, just email me Liesl at homeschoolden dot com or use the contact form. 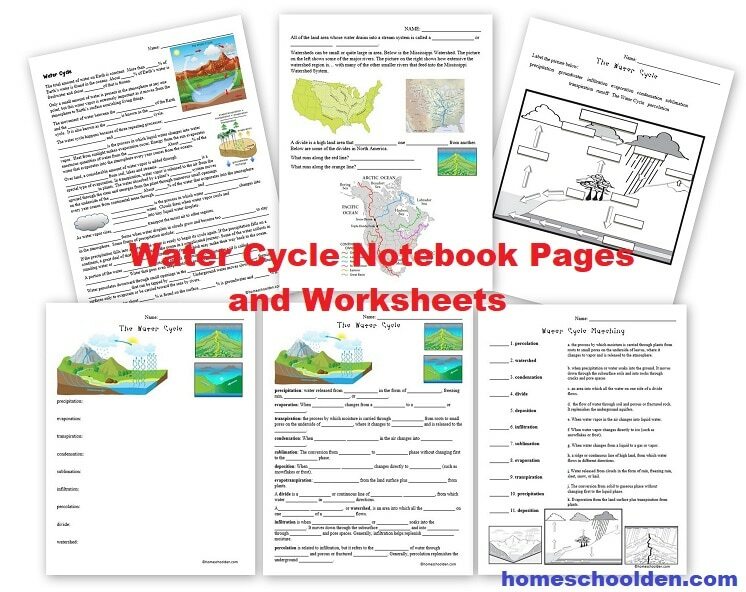 The Water Cycle Packet is $4.99 $2.50 until April 30th, 10pm EST. You can use this button if you plan to buy anything else from Our Store. Be sure to check your PayPal email address for the download link! P.S. 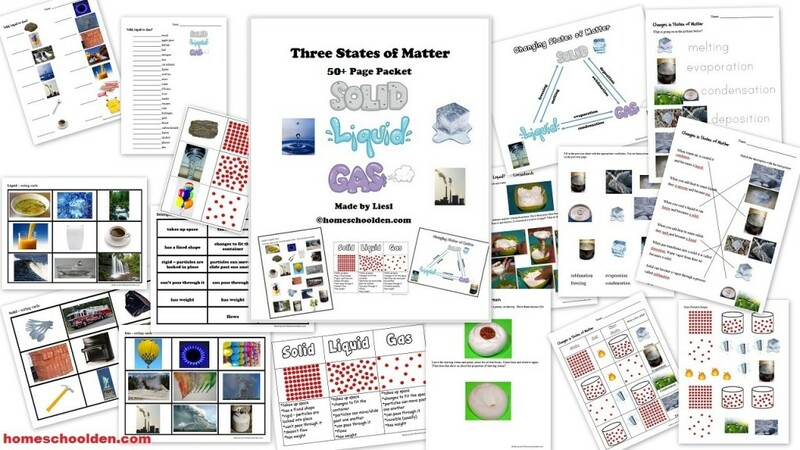 We already learned about States of Matter: Solids, Liquids and Gases before we did this unit. 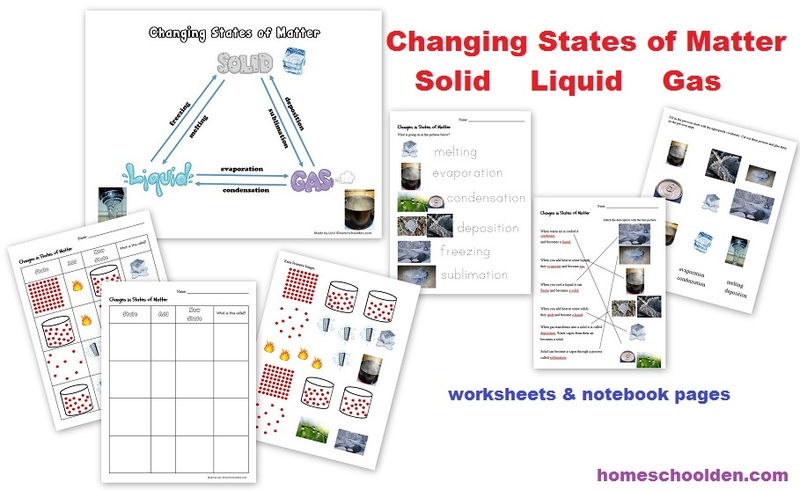 We learned about the changes in states of matter and did quite a number of hands-on activities about sublimation and deposition. You can do lots of hands-on activities with dry ice to help your kids understand those tricky terms!